Where do I start? My name is Minerva Wagner. My husband, Paul, and I graduated from Orchard High School in May of 1956. I worked for Floyd County and Mitchell County Farm Bureau in Osage and Charles City after I graduated. Paul and I were married October 20, 1956. Paul farmed with his Dad and brothers after graduation. Paul helped build a big portion of the buildings on the home farm. I quit working and started helping on the farm. We milked cows and sold Grade A milk. Paul decided in 1978 to quit farming and we moved to Osage where we reside still. We had five children: Michael, deceased in 1991; Therese, who lives in Hudson, Wisconsin; Laura, who lives in Cedar Rapids, Iowa; Bechi, deceased in 2008; and LeAnne, who now resides in Chicago, Illinois. We have 11 grandchildren and 12 great grandchildren with the 13th on the way. After we moved to Osage, Paul started his own construction company and I started in the work force again in the Daylight Store for a short while –where they had a fabric department. Then I was asked to work for Larson’s Hardware Hank which lasted 23 years. I guess it was in the early 70’s when I started to quilt. I saw a Grandmother’s Flower Garden that my aunt had made and said I would like to make one. She gave me a cardboard hexagon and showed me how to do it. I really started going gung-ho on it, all by hand. Needless to say farming and milking cows took up a lot of time along with raising 5 children, so it got laid aside. When we moved to town I took up working on the quilt again. I thought it needed freshening up, washed it and it all fell apart. I wanted to learn the right way to quilt so I signed up for a Cassie Kloberdanz class through NIACC. I lucked out because it was the last class she taught. I learned from the master. She taught us so many techniques, among them was the English paper piecing method to make the Grandmother’s Flower Garden quilt. That was really my first quilt I made with so many more to come. I belong to two quilt guilds: North Iowa Quilt Club in Mason City, Iowa – we meet the second Wednesday of the month with classes in the morning, potluck at noon, and our meeting after; and the Cedar Valley Quilt Guild in Osage – we meet the last Monday evening of the month. The North Iowa Guild has a quilt show every other year. Both guilds do charity quilts for compassion, Habitat For Humanity and many more organizations. Meeting new and interesting quilters has been a wonderful experience for me. catching up to do. My background fabric was called Butter, a very pale yellow and the rest of the fabric I used from my stash. 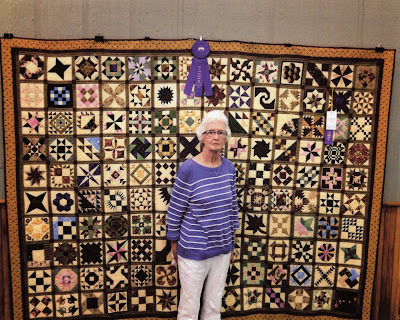 My quilt won me a Best Show ribbon at the North Iowa Fair in 2013 and Best of Show in Our Quilt Show 2014 in Mason City. Quilting is my therapy. I have never counted the quilts I have made and given away as all of our children have one and also the grandchildren. My favorite author is Trudie Hughes and my favorite fabric is oriental although I have made only one quilt for myself and a wall hanging. My days are filled up with the little dog we inherited, quilting and visiting my husband Paul in the nursing home. Other quilts besides Sylvia’s Bridal Sampler I am exhibiting at this time in the Mitchell County Historical Museum located in the Cedar River Complex are: “Christmas Poinsettia”, “Crowning Glory”, “Grandmother’s Flower Garden”, “Any Which Way Scrap Tamers Quilt”, “Japanese Fan”, “Kaleidoscope” and “4 Patch Stacked Posies".